Our Adjustment of Status was a little harder to pull together and took awhile for us to get. We also had some back and forth with USCIS on what documents were required for Employment Authorization and eventually a Green card. Again, I used Visa Journey as my guide for all the paperwork. Here are the instructions for AOS. Where we went wrong was with the I-864, Affidavit of Support. My dad and I were both supporters of my husband as I had been freelancing for work with all the back and forth traveling to and from England. What we did not include in this package, which we had in previous ones was a photocopy of my and my dad’s passports and birth certificates to prove that we were American citizens. Even though we both had social security cards that were sent and our tax returns, they needed the copies of both those documents in order to get EAD and the Green card. This was our one and only RFE (Request for Evidence) that we received during our Visa Journey. We also had to go and get an additional physical by a US Civil Surgeon in order to send all the required paperwork:I-693, Medical Examination. The physical that was conducted for the I-129F did not count for AOS. This proved to be a couple of hundred dollars spent just for having a Dr. sign-off on my husband. He didn’t even check his pulse or heart rate which is a bit of a joke. 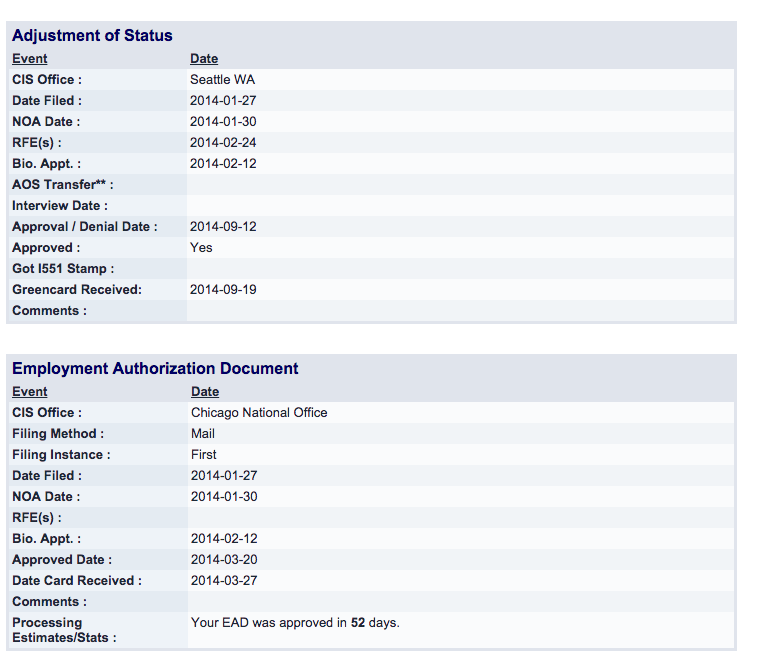 After the paperwork was sent in and when we received our appointment for biometrics, it was a couple of months off. So we went ahead to the processing center and requested that my husband be seen for his biometrics appointment prior to the date that we were given. This ended up not being an issue with our processing center and we went on our way. We do not know if this sped up the process at all in our case, but it helped us know that we did all that we could do. We called USCIS every week asking for my husband’s paperwork for his EAD to get processed quicker as he had a job offer and we did not want it to go away. Unfortunately, they got to it when they got to it, and it took us the 2-3 months processing time that was estimated for EAD at the beginning of the process. We then received a letter in the mail that said that we did not require an in person interview, but because of it the Green card would take an additional 90 days on top of regular processing times. At this point, my husband was able to work and we didn’t need to leave the country for any reason so we just waited. We waited and waited and he finally got his Green card. The next weekend, we were up in Canada, just because we could. It is a long and hard process to get your Green card. Especially when you are doing it legally and following all the processes. I would never want to go through it again. Looking back, I am so happy that I had the support of Visa Journey and the community there who were going through the same process and could sympathize and offer encouraging messages and help when it was needed. I could not recommend the site more.